Just ate this. Five minutes ago. Can’t stop. So good. It’s Monday and it’s back to blog go-time! Today I’m being a vegetarian with this Honey Ginger Tofu and Veggie Stir Fry and HELLO WORLD it tastes really superyummy. All last week I was vacationing on the most beautiful beach (pictures? tomorrow? same time same place? see you there. ), and now that it’s Monday I have to be a real person again. Sad face. But being a real person does have some perks, and right now those perks include being in my own little snuggly kitchen again and eating things like honey, ginger, tofu, asparagus, carrots, and all the other veggie stir fry things without having to share and without any tofu mockery from my family. Because let’s be real – my family’s favorite food does not equal tofu. This dish is a vegetarian wonder. Your plate starts with a bed of fluffy grains, like white rice or brown rice or farro (adventure!) and then gets covered with some sauteed veggies and some golden brown tofu and an extra measure of that homemade honey ginger garlic sauce that I am still licking off my fingers. The combination of colors and textures and flavors is my favorite. Plus the healthiness. Plus the good leftovers. All of it. Favorite. So tofu is one of those foods that makes me wince a little bit every time I hear it. Ahh, eeh, ugh! vegetarian food! weird and scary! But brace yourself: I’ve really come to like tofu. This has probably been coming for a while now. I’ve always preferred my takeout Pad Thai with veggies and tofu, and I occasionally order tofu at restaurants when soaked or fried in things like creamy, spicy, salty, wonderful sauces. Then I went and made a reeeeally yummo Sweet Chili Garlic Tofu recipe and my eyes were re-opened to cooking with tofu MYSELF, in my very own kitchen, like a real vegetarian (which I am not but which I act like from time to time). These rural Minnesota tastebuds are spreading and flying, you guys. Even Bjork – and if that’s not the most non-tofu-eating-person name ever – is on board with this honey ginger tofu and veggie stir fry biz-nas. And if you’re not tofu-brave, just use chicken instead. I will pretend that that would be just as good and we can still be friends on the outside. A few final tips for your veggie stir fry: I’m really into this new trick that involves peeling my carrots instead of grating them. I don’t mean just peeling the skin off, I mean peeling the skin off and then using the peeler to peel the carrots themselves into long curly strips almost like noodles. They are long and bendy and more fun to eat than the old box-grater variety. And side note – do I need to buy a spiralizer in order to continue my life as a food blogger? Because I’m starting to wonder about those zoodles. Please advise. Another tip: try using farro. I still don’t know how to pronounce that (pharaoh? or farr-oh) but I do know that I used it as a nice comfy bed for my honey ginger tofu and veggie stir fry and it was a really good thing. Nutty, fluffy, filling, and delicious. Plus I think it’s healthy or whatever you call it. My final tip is to double this. I mean, don’t, because it serves 6 people already. But if you’re generally hungry and you like lunch leftovers (me! me! me!) then make as much of this as you can store in your fridge. The flavors will soak their magic into everything and YUM. I am sosososo excited for lunches this week. 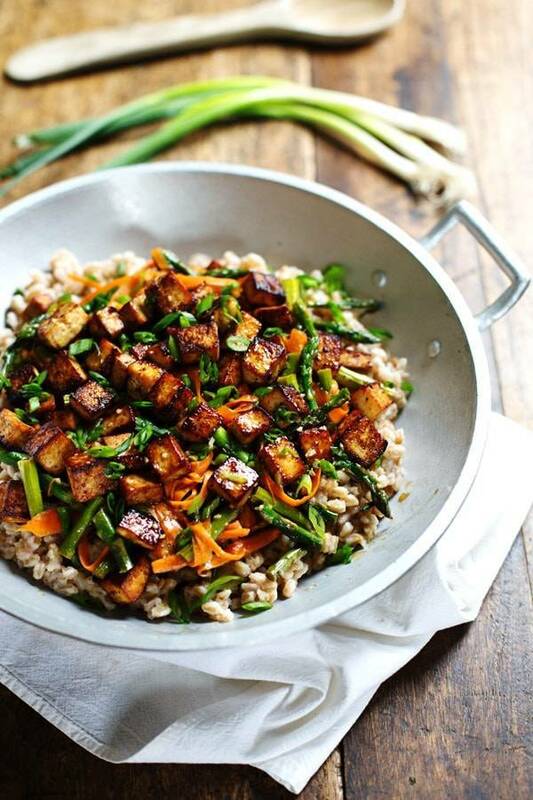 Now go and make something awesome, you honey ginger tofu and veggie stir fry lovers! 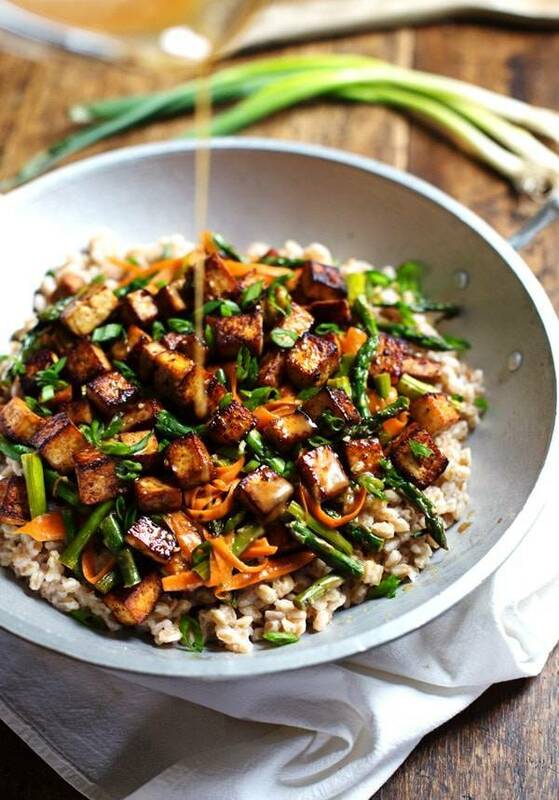 This Honey Ginger Tofu and Veggie Stir Fry is SO delicious! Served with a simple homemade honey ginger soy stir fry sauce. Tofu: Cook the rice or farro according to package directions. Cut the tofu into slices and press with a paper towel to remove excess moisture. Wait a few minutes and press again – there’s lotsa water in there! Cut the tofu slices into small cubes. Heat the oil in a large nonstick skillet over medium heat. When the oil is shiny, add the tofu and about 1/4 cup of the stir fry sauce (watch out because the sauce and oil will spatter a tiny bit – have a cover ready or just skip the sauce at this point). Pan-fry the tofu until golden brown. Remove from the pan and drain on paper towel lined plates. Veggies: Return the pan to the heat and add the asparagus with 1/4 cup stir fry sauce. When the asparagus is bright green and tender crisp, add the carrots and toss together. 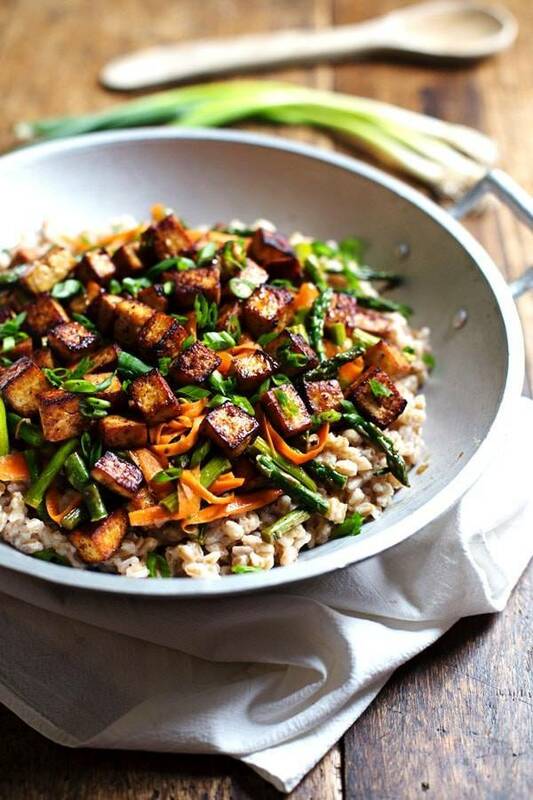 Arrange the veggies and tofu over the cooked rice or farro, and cover with more sauce to taste. Sprinkle with the green onions. To make this gluten free, make sure your soy sauce and your tofu are both certified gluten free brands. To make this vegan, use an alternative sweetener in place of honey. You can find tofu in the produce section of most grocery stores. I sprinkled mine with the tiniest amount of chili powder right in the frying pan to bump up the golden color. I like to peel the carrots into long strips instead of grating. For a completely sugar free version of this recipe, use white distilled vinegar. Wow this sounds so good! I love farro and tofu so I’m definitely going to try making this. My healthy, adventurous and amazing mother that taught me cook and appreciate food turned me on to your newsletters a while back. She said you were very funny and had unique but simple recipes using our pantry staples that I’d love. She was right! I love your blog and have tried several recipes (out of the dozens I’ve printed off), which have all turned out so nummy! Last night, I made the peanut butter cookie dough balls for my hubby, who loves to eat raw cookie dough more than cookies for dessert but also loves dates ever since he tried them for the first time on our backpacking travels abroad. He was smitten! I also just started food prepping since my hubs has returned to the military and I’ve returned to university classes, meaning neither of us have much time to cook anymore. We love our dessert-y snacks, but also try to eat very healthy, with a Paleo-ethnic flair. For all of these reasons, your recipes seem to fit into our life just right! P.S. On the subject of zoodles, I have started using alternatives like these and cauliflower rice/crust to cut carbs, and I have to say that I really like them so far. The secret to them is wring, wring, wring out the moisture! And as for the spiralizer, I have a food processor with the grate/julienne disc blade for cheese or French fries that makes perfect zoodles…way better than the spiralizer doohicky I also have. It requires very large and straight vegetables cut into shorter rounds that still stick and wobble or topple over or turn to mush. I wouldn’t bother with the latter if you have the right attachment for your processor. I was just patting myself on the back the other day for buying shredded carrots to add to my ginger/cashew stir fry (don’t worry, I got the recipe for a magazine, not my own!!) and you totally OUTDID me with your curly strips of carrot. Now I have to deal with curly strips of carrot envy. And yes, I think you need a spiralizer. ASAP. You’re a food blogger! I’m not getting one right now because 1) I’m not a food blogger 2) I have no where to store it. Love the use of tofu and hope that I have the courage to use it and go through with it. If not, like you said, I may cheat and use chicken! I’m still unsure about tofu. But, I don’t only want to be friends on the outside – so I may just have to try this. I am SO DOWN with the rest of all the things in this stir fry….farro? YES! Love me some adventure. Yes! I was wondering if there was another way to do it! I’ll be YouTubing that asap. Get one with a guard and stand! I had to youtube how to use one too lol. First the cheesy cauliflower sauce and now this honey ginger garlic sauce! 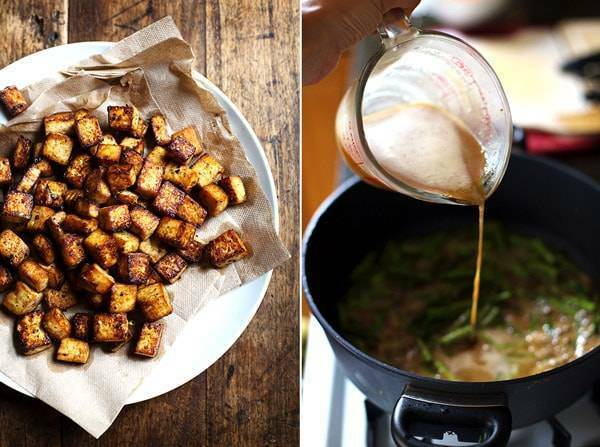 Wow…tastebuds please be still…I love tofu and love all how well browned yours looks – simply mouthwatering! I am a lover of tofu and lately, I have been making a spicy ginger orange tofu at least once a week for a while now. I rarely make recipes (the exact same way) 3 times a year, so it is a for sure keeper. Will have to give this one a try as well – looks delicious! Spicy ginger orange! I like the sound of that. Oh yummy! This may have just gotten me out of my “I wish I had a personal chef” rut. That stir fry sauce looks like a recipe for success! I’m excited to give it a try. On the Spiralizer front, you can use the mandolin trick like Taylor suggested, or a vegetable peeler, or a Thai Kom Kom Miracle knife, or my mom taught me to make zoodles the same way that old ladies peel apples for apple pies. That’s really time consuming and more like therapy than cooking. I second the julienne peeler! Spiralizer! I totally just asked for one for my birthday because, I KNOW. It feels like I NEED one 😉 However I do have a Y- peeler and it works really well to make zoodles. Wow, that tofu looks so so delicious! I love tofu, it’s so versatile, cheap, and just amazing. I’ve never used farro before, it sounds good so I’ll have to give it a try sometime soon. I bought a zyliss julienne peeler to use for making vegetable noodles. I really loved it for the first couple of months, but it broke. I think spiralizers are great for hiding vegetables in noodly things, so if you like that sort of thing maybe you should get one! I’d like to eventually get a spiralizer but for now a regular peeler does do a pretty good job. Ooh I like it! I’m going to check out that peeler! Jealous. My favoritest of the favorite salads. Oh. my. gosh. This looks totally divine!! Can’t wait to try it. I love tofu – when i’m trying to be extra healthy I bake it. Also wondering about buying a spiralizer but there’s a limit to how many kitchen implements one person can own…(and a limit to how much I can fit in my little kitchen!) Will have to make do with a veg peeler for the moment! I feel ya on the small kitchen thing. I love tofu – since I’m vegetarian. But I love your tofu better, it looks so good all golden brown. That sauce is amazing too.. it sounds flavorful. I have tofu sitting in the fridge, its happening tonight. I am so excited to see a new, fresh and inspiring tofu recipe! I’ve been a fan of the stuff for about 10 years now and I’ve experimented with it quite a bit. I haven’t been able to eat much lately because my husband and step daughter cringe at the thought of it. Although, I have been tempted to sneak it in their food and not tell them. I like to freeze my tofu first and then thaw it prior to cooking for a bit more of meaty texture. This might be one of those recipe I must make for myself to nom nom on for lunch! What a great tip – I am totally going to try that! Thanks Chrystal! This seriously sounds and looks sooo good! The farro, YUM! I literally just started using the grain and am huge proponent now! Also love the new take on tofu, when it’s cooked right and gets the crisp outside…so good! Yep! Love me some browned and crispy! I’ve recently become obsessed with farro! It looks sooo good here. Also, I’ve always been a fan of tofu, but my hubby is on the anti-tofu bandwagon. I wonder if I could win him over with this. The texture of yours looks great! Just wanted to say – I love your blog! Not to be corny – but you’ve seriously changed the way my husband and I cook! I adore the healthy recipes that I actually have ingredients for that are easy to make and family friendly. The once in a while more indulgent posts are welcome too. I love hearing about your story and enjoy making your recipes as our own stories are made, like making blender lemonade for picnics and getting flour all of the floor as my four year old helps me make the deep dish cookie. I look forward to making this tofu dish soon. Thank you and good luck as you leave one chapter to focus more on this – you’re doing great! This is the sweetest comment! Totally brightened my day. Thanks Tess! 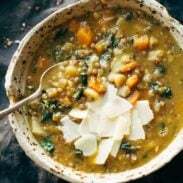 This looks great – definitely going to make this week as I’ve embarked on a vegetarian diet for the next 2 weeks (aka not eat pizza every other day). Don’t have a food processor – does a blender work for the sauce? Just pulse until smooth? That tofu… mmmm yummy! And that sauce?! This just bumped out something on my menu plan. I’m making this dish instead! I actually have farro in my cupboards too, but haven’t used it yet. You win, Lindsay. You win. Okay, update: the farro is EVEN BETTER the next day after it soaks up the leftover sauce. Oh my gaaaash. I couldn’t stop. Such a beautifully done tofu! Loving this recipe! I too love ordering veggies and tofu at asian restaurants instead of meat, it’s the best! I finally tried tofu about 2 years ago and could not believe how much I loved it. You can make it taste like anything you want. However, I haven’t made it myself. So…I bookmarked this and will be making this dish soon, it is so perfect in every way, Lindsay. Thanks! Thanks Matt! It gets a bad rap but it sure is versatile and yummy!